In a remote place in the desert of West Texas, outside the small town of Andrews, something dirty has been going on which threatens the water supply of nearly a third of America's farmland (and perhaps the millions of people who eat the food grown using that water). The highly radioactive spoils of nuclear power plants from 36 states -- as well as other seriously toxic or carcinogenic substances, such as PCBs dredged from the Hudson River -- are being dumped there on a regular basis, and this will continue until the designated hole in the ground is filled. At 174,000 square miles, the Ogallala Aquifer is the world's second largest, providing water to 27 percent of the entire agricultural land in the United States. 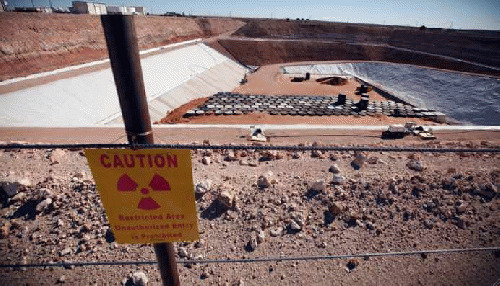 An aquifer can be a superhighway for nuclear waste, as shown by studies of the movement of waste at polluted nuclear sites such as Hanford, Washington. The dirty dump owes its existence to dirty politics. Local residents say officials came to town to conspire with billionaires on ways to silence their opposition to the dump. Owned by Waste Control Specialists (WCS), the site was built by Harold C. Simmons, a top contributor to the campaigns of George W. Bush, Rick Perry and the Super PAC run by Bush confidant Karl Rove. Opponents say that WCS amounts to "a privatization of nuclear waste to help a billionaire make billions of dollars more." According to Texas Commission on Environmental Quality geologists (TCEQ), leaks from the dump are inevitable. If those leaks got into an aquifer though, the result could be potentially catastrophic. The Ogallala Aquifer these days is being depleted at a much faster rate than it's being replenished. According to a report by the Massachusetts Institute of Technology, groundwater contamination, lenient regulations and a lack of goals by policymakers are causing major problems in this vast ancient fresh water source which took millions of years to be created. MIT says that at present rates of use the Ogallala will be drained within this century. A controversial report by Texas Tech University claimed that WCS would not damage any important underground water source. This assertion paved the way for the deal. Texas Tech, however, is widely seen as beholden to major Texas political figures. Environmental activist Lon Burnam, a member of the state legislature for 18 years and director of the Dallas Peace Center, tells ThisCantBeHappening.net that "corrupt" Texas state officials falsified the location of the aquifer by drawing maps that wrongly showed no aquifer under the WCS site. Burnam told ThisCantBeHappening! that WCS, which was built by "flawed engineering and science," can't keep water out of the dump. He says that for months at a time WCS has needed to pump out water seeping from the aquifer. That same water -- possibly now contaminated -- also flows back into the aquifer. It is a two-way street. WCS claims that hundreds of feet of impenetrable red clay are between the site and the nearest ground water. But the TCEQ geologists found that, first of all, there is actually only 14 feet of separation between the site and the nearest groundwater, and secondly, that the so-called impenetrable wall is riddled with holes and fissures. Meanwhile, an independent study done years earlier by the consulting firm Terra Dynamics, which sampled 58 boreholes at the site, found 46 samples that were described as "moist," five as "wet," and one as "making water."